Silverton Northern Railroad Caboose #1005: This caboose was built by the Denver & Rio Grande in 1880. It is known as a "class 1" type caboose and is the only 4-wheel "class 1" built by the D&RG that was never rebuilt into an 8-wheel caboose, the same type that is more commonly seen today. The caboose served as the Denver & Rio Grande #17 and was later renumber as caboose #0516. After 15 years of service on the D&RG, this caboose was sold to Otto Mears in 1895 who put it to work on his Silverton Railroad and then later on the Silverton Northern Railroad as their #1005. In the 1930's this caboose was removed from service and used as a shed in Silverton. By 1958, the car body was being used as a storage shed for paint behind the Western Colorado Power Company office building. 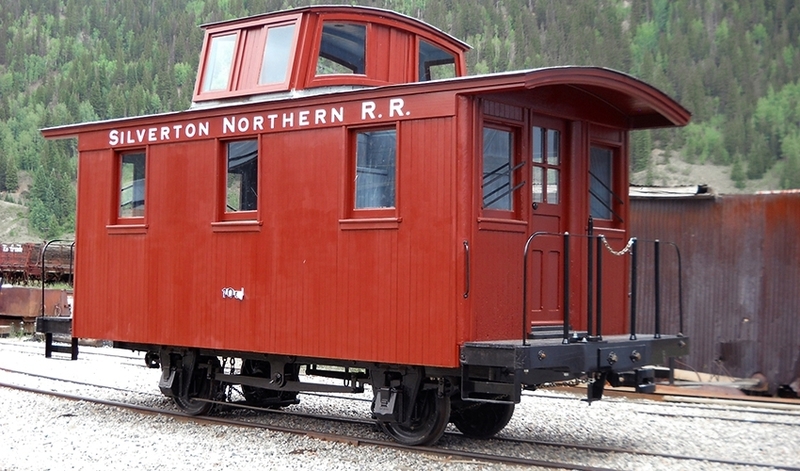 However, later the Silverton Chamber of Commerce acquired the caboose body and used it in a number of displays around the town and eventually it was placed in a Park on Blair St. for a number of years and occasionally served as a small visitor's information booth until it was falling into disrepair due to lack of maintenance. In 2000, the San Juan County Historical Society acquired the caboose and had it moved down to Durango where the D&SNG car shops could look it over and give the society an estimate on the cost of a rebuild. After sitting in the D&SNG rail yard for a number of years, it was decided to return Caboose #1005 to Silverton in 2010 and put it in the newly refurbished Silverton Northern Engine House where a restoration effort led by San Juan County Historical Society, with Klinke & Lew doing the contracting, has now been completed. Silverton Railroad Baggage Car #5: This rare baggage car is the oldest narrow gauge railcar to survive in the state. It was originally built in the car shops of the Denver & Rio Grande Railway back in 1872. At that time is was built as Mail & Baggage car #2. In 1885, the D&RG decided to renumber their entire fleet of passenger equipment and the old Mail & Baggage Car #2 was renumbered as Express Car #150. By 1888, Otto Mears was finishing the construction of his new Silverton Railroad. Needing equipment to operate on his new railway, Mears purchased used locomotives and rolling stock from the Denver & Rio Grande. One of the cars he purchased was Express Car #150 but before it was delivered to Silverton, the express car went to the D&RG Burnham Shops in Denver to be rebuilt into the baggage car configuration that the car is in today. This "new" baggage car was delivered to the Silverton in 1888 and became the Silverton Railroad’s baggage car #5. This car was used extensively over the years and would eventually even out last all three of Silverton's Short Line Railroads. It was used as a shed in Silverton for many years before being acquired by the San Juan County Historical Society. Today, this car is stored near the recently renovated Silverton Northern engine house awaiting a full restoration. Denver & Rio Grande Western Boxcar #3624: This boxcar was originally built in 1903 by the American Car and Foundry in St. Louis, Missouri. The next year, it was delivered to the Denver & Rio Grande Railway in Colorado. After hauling freight through the Colorado mountains for 23 years, it was rebuilt with new wood and a sheet metal roof called a “Murphy Roof”. 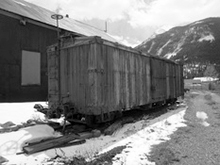 After its service on the D&RGW was compete, this boxcar was acquired by Bernie Watts and later by Silverton resident, Bill Jones who moved the car to Silverton. Bill Jones went on to generously donate the boxcar to the San Juan County Historical Society. Currently, boxcar #3624 is stored near the recently renovated Silverton Northern engine house awaiting use on the rebuilt Silverton Northern Railroad.